Welspun power & Steel limited (WPSL), a part of the US $ 3000 million Welspun Group, has set up a state-of-the-art facility to manufactured Ribbed thermo mechanically treated (TMT) rebars. 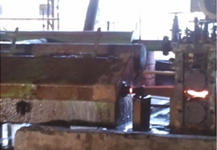 The heat treatment process ensure that the rebars meet stringent quality standards and exhibit higher strength, better ductility, bend ability and weldability over the conventional bars used in the construction industry. Here the ‘Tempering' begins as the bar leaves the water-cooling section. In the stage the heat flows from the core to the surface layer, transforming it into a structure called ‘Tempered Matensite', while the core continues to stay ‘Austenitic'. This composite structure gives excellent yield strength to the bar along with superior ductility and Weld ability. In the past, the conventional mild steel round having low yield strength were used for concrete reinforcement. These bars were then replaced by cold Twisted Deformed Bars exhibiting better yield strength. Even with controlled carbon content, these bars continued to have the inherent problem of poor weld ability and ductility. Beside, additional twisting operation induced torsional stresses, which further reduced the corrosion resistance. 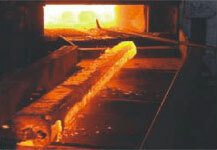 The heat treatment process in Welspun TMT Rebar's eliminates all these undesirable effects. thus higher strength is attained even with lower carbon content and they also have excellent ductility, outstanding bend ability and superior weld ability. The low temperature rolling further enhance the quality of welspun TMT Rebars by way of higher strength . Besides this because of tension free rolling close tolerance is possible and uniform quality of the product of the product is guaranteed. Further more Welspun TMT Rebars facilities ensure easy and safe handling and eliminates any damage to the product.